Marcus Martin isn’t quite certain where he’ll be on the 49ers offensive line in 2015. 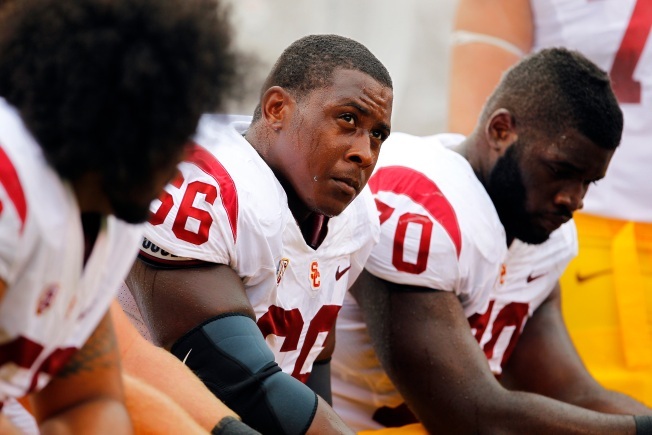 The second-year pro from USC could be at center, right guard or left guard, or he could serve as a multipurpose backup at all three spots. But one thing is certain: Martin is in the 49ers’ long-term plans. Martin stepped into a starting role at center in 2014 after a season-ending injury to Daniel Kilgore and, after a rough start, was playing well by the end of the season. And as noted by Tyler Emerick of 49ers.com this week, Martin achieved his NFL baptism while being the youngest player in the league, just 20 years old when he made his first start. He’s worked out hard this offseason to get stronger and get in better condition to play in an offense that promises to be more fast-paced under new head coach Jim Tomsula than it was under Jim Harbaugh. He told Emerick recently that veteran tight end Vernon Davis has been a mentor, helping him focus on conditioning and strength training. “One thing I learned from his is that you can’t get any better in your career without hard work,” he said. Martin played his rookie season in San Francisco at about 330 pounds. He intends to enter training camp about 20 pounds lighter. He told Eric Branch of the San Francisco Chronicle in June that “a whole different level of fitness” would be required this coming season. Martin believes he can be a much better player in 2015 than he was as a rookie. He says he’s not going to worry about what Kilgore can do at center, or what Brandon Thomas can to at left guard or what the situation is at right guard.